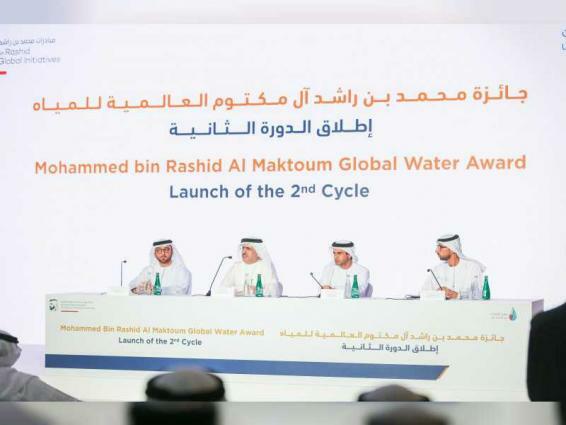 DUBAI, (UrduPoint / Pakistan Point News / WAM - 16th Apr, 2019) The UAE Water Aid Foundation, Suqia, has announced the details of the second Mohammed bin Rashid Al Maktoum Global Water Award. The award, launched by His Highness Sheikh Mohammed bin Rashid Al Maktoum, Vice President, Prime Minister and Ruler of Dubai, encourages research centres, individuals, and innovators around the world to develop sustainable and innovative solutions using solar energy to address scarcity of potable water. Overseen by Suqia, under the umbrella of the Mohammed bin Rashid Al Maktoum Global Initiatives, the award has three main categories, the "Innovative Projects Award", the "Innovative Research and Development Award", and the "Innovative Individual Award", with prizes totalling US$1 million. The Innovative Projects Award targets government, semi-government, and non-government organisations. The award has two sub-categories, the 'Large Projects Award' with prize money totalling $300,000, and the 'Small Projects Award' with total prize money of $240,000. Individuals and teams from academic institutions and research centres that are independent or annexed to government or semi-government organisations can apply for the Innovative Research and Development Award. It has two categories, the National Institutions Award, and the International Institutions Award, with prizes worth $200,000 each. The Innovative Individual Award has two categories: the "Youth Award", which targets young individuals aged between 15 and 35 years with a prize value of $20,000; and the "Distinguished Researcher Award" with a prize value of $40,000. "This year’s award builds on the success of the first one in 2017, which attracted 138 participants from 43 countries," said Saeed Mohammed Al Tayer, Suqia Chairman of the board of Trustees. More than nine million people in 34 countries had benefited from Suqia’s projects by the end of 2018, he added. Terms and conditions to apply to the awards are available on the Suqia website. The deadline for submissions is 30th June, 2019.